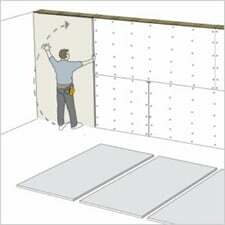 While Green Glue Compound is sticky, it is not an adhesive and should never be used without fasteners. 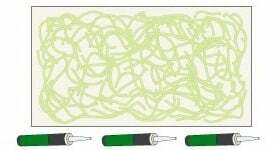 A larger opening on the nozzle (1/2″) will speed up application without affecting the performance of the Green Glue Compound. 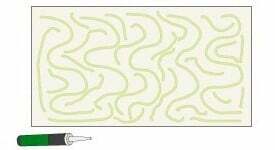 Using a razor knife, cut a 3/8″ to 1/2″ bead off the end of the nozzle. Submerge the orange cone nozzle about 2″ into the Compound. 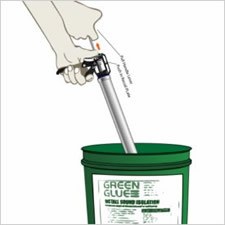 Eliminate mess by keeping the barrel of the Green Glue applicator gun from touching the Compound. 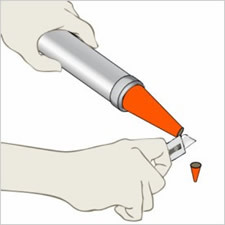 Press the recoil thumb plate down while using a Green Glue dispensing gun, and pull back on the recoil T-lever, drawing Green Glue Compound into the dispensing gun, until full. QUICK TIP: If the Green Glue Compound does not seem to be loading into the dispensing gun very well then cut a larger bead opening on your nozzle cap. 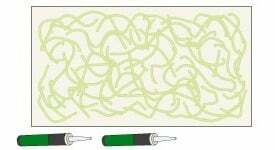 With your drywall on the floor or leaning against a wall, apply the Compound from your green glue caulking gun in a random pattern. 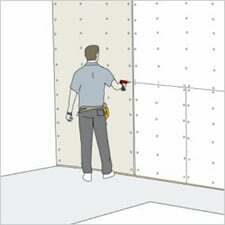 Be sure to leave a 2″ perimeter so you can hold the drywall while lifting it into place. GOOD IDEA: Have a bucket of water for the dispensing gun. Green Glue Compound will cure very slowly if kept wet so the dispensing gun can be left submerged in water for days. 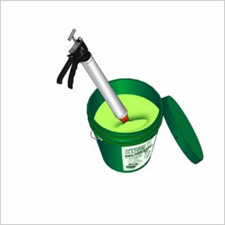 We strongly recommend using a Green Glue Dispensing Gun for quick and accurate application. 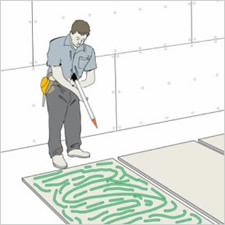 A 1/8″ notched trowel can be used, but is more messy and difficult to apply the correct amount of Green Glue Compound per square foot. Green Glue Compound is a very sticky product that becomes incredibly difficult to clean once it has cured. 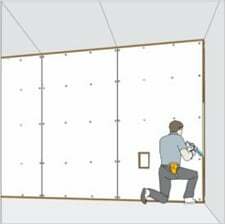 For this reason, it is crucial to fully clean the dispensing gun after each use. Otherwise using a Green Glue dispensing gun will become impossible. Cleaning involves disassembling the dispensing gun and using water pressure to remove all Green Glue Compound residue from the cone nozzle, barrel, and inner workings of the tool.